When the weather is hot, an efficient AC unit can be a real lifesaver. Keep your window air conditioner in top condition by following our easy guide to cleaning it. 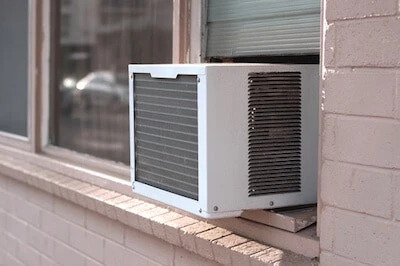 A window air conditioner is one of the best ways to remain cool in hot weather, but it’s important to know how to keep your window AC unit in top working order. Get the most out of your unit and save yourself money on future repairs and replacement by following our guide to cleaning your window air conditioners with ease. As with all AC units, you should make sure you book full maintenance of your air conditioner at least once a year. This will involve checking the state of the coils, removing any dirt, debris, and ice, inspecting the air vents and straightening the coil fins. You can do some of this yourself, but if in doubt call a professional. Cleaning your window air conditioner isn’t just important for prolonging the life of the unit, but it is vital for protecting the health of your home’s inhabitants. One of the main problems that can occur with window AC units is that they are vulnerable to mold. A build-up of moisture and lack of airflow can cause mold spores to form, which are then released into your home and living space. Mold spores can be damaging for your property and for your respiratory health, so it’s important that you reduce the chances of them spreading. If your window AC starts producing a dank, musty smell when it’s turned on, or you can see mold forming on the exterior, it’s definitely time for a clean. Cleaning your window air conditioner will not only improve your personal health and that of your property, but it will also ensure your AC will last as long as possible, negating the need for frequent repairs or replacements. Read on to find out how to clean window air conditioners, to get rid of mold, keep you cool and ensure everything is working effectively and efficiently. 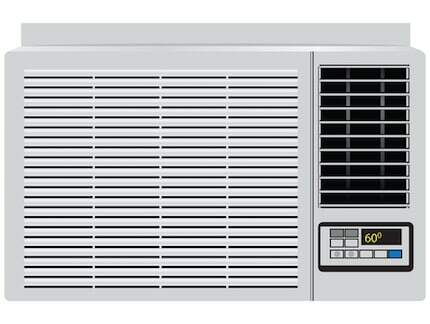 Recommended Article: Looking for a tiny AC unit? We’ve got you covered in our latest guide. Cleaning a window air conditioner might seem like an awkward thing to do, but in a few short steps, you can have it cleaned and working perfectly again in no time. Before you begin the cleaning process, it’s a good idea to lay down some protective sheets on the floor beneath your AC and put on any safety gear you might want to be wearing, such as gloves and an eye mask. Now you’re ready to go. You can easily clean a window air conditioner without removing it from the wall and by using just the cleaning products you probably already have around the house. Here are the steps you need to take. Switch off and unplug your air conditioner to make sure that there is no electricity passing through it while you work. The next thing you need to do is remove the front grille, to give you access to the filters and coils within. Often, this can be done by simply pulling the grille down and out, although it may be screwed in, in which case you’ll need a screwdriver for the job. There are two types of filter commonly used in window air conditioners: disposable and reusable. If your filter is disposable and your AC is showing signs of mold or other build-up, it’s time to replace it with a new one. If your filter is reusable, you need to clean it. This can be done with a gentle solution of warm water with detergent or dishwashing soap, applied with a sponge or a soft brush. You can also leave it to soak in a sink of warm water and detergent, as this will help loosen up any grime and make it easier to clean. Recommended Reading: Don’t miss our awesome guide to quiet portable AC units in our latest post. Using a vacuum cleaner, return to your air conditioner and clean away any dust and debris that may have gathered inside the unit. Make a mild solution of warm water with bleach and, using a cloth, wipe the remaining dirt and any visible mold away from the interior of your AC. One of the best ways to tackle mold is by using warm water mixed with a little bleach, as this not only cleans but it kills the mold spores and stops future mold growth in its tracks. Make a solution with 2 or 3 gallons of warm water with ½ a cup of bleach and a good squeeze of gentle dishwashing soap and clean the interior of your AC thoroughly with a sponge, a soft brush or the brush attachment that came with your vacuum. Once cleaned, leave your air conditioner to dry. If you’ve washed a reusable filter, make sure this is propped up to dry too. Once your unit and the filter are completely dry, replace the filter, screw the front grille back on and plug back in. Not only will this eradicate any unpleasant side effects of mold, but you’ll notice your air conditioner is now working much more effectively. Regularly cleaning your window AC unit is essential to keep it working correctly and will ensure it carries on providing you with excellent air conditioning when you need it the most. It’s not difficult to clean your AC, but if neglected, the unit will not work effectively and its lifespan will be significantly reduced. We hope you’ve found the answer to the question of how to clean a window air conditioner without removing it and that you continue to maintain your home appliances yourself. DIY maintenance is rarely as complex as you might first imagine it to be. It’s advisable that you perform a full clean on your window air conditioner at least once a year – an ideal time to do this is in spring or early summer before you will start really needing to use it. Check back soon for more guides like this!